Soot comprises tiny black particles, about 2.5 micrometers or smaller, made of carbon produced by incomplete combustion of fossil fuels. Breathing in the particles can lead to lung damage, cancers, and other conditions. A 2015 conference paper presented at a meeting for the American Association for the Advancement of Science estimated that in 2013 more than 5.5 million people worldwide died prematurely from air pollution. In India alone, air pollution has been linked to anywhere from 1.1 million to 1.4 million premature deaths over the past few years, according to various studies. Back at MIT, Sharma set out to help solve this dire air-pollution issue. After years of research and development, Sharma’s startup Graviky Labs has developed technology that attaches to exhaust systems of diesel generator chimneys to capture particulate matter. Scientists at Graviky then treat the soot to turn it into ink, called Air-Ink, for artists around the world. So far, the startup, which is commercially piloting its KAALINK devices for use on diesel generators across India, has captured 1.6 billion micrograms of particulate matter, which equates to cleaning roughly 1.6 trillion liters of outdoor air. More than 200 gallons of Air-Ink have been harvested for a growing community of more than 1,000 artists, from Bangalore to Boston, Hong Kong, and London. “Less pollution, more art. That’s what we’re going for,” Sharma says. KAALINK is a cylindrical device that retrofits to the exhaust systems of vehicles or diesel generators and relies on static electricity, a phenomenon in which energized materials attract particles. Inside the device are cartridges filled with a high-energy plasma. An applied voltage triggers the plasma to attract soot particles flying by, ridding the air of roughly 85 to 95 percent of particles without affecting the exhaust system. A KAALINK device can stay on an exhaust system for about 15 to 20 days. Users then empty the disposable cartridges into special Graviky Labs collection units, where they are sent straight to the startup’s lab for treatment. This system — co-invented by Nitesh Kadyan and Nikhil Kaushik — removes heavy metals and toxins to create usable Air-Ink. Currently, KAALINK isn’t a consumer product. Graviky primarily sells the filter to companies and organizations in India for capturing soot from the diesel generators that help power hospitals, malls, schools, apartment complexes, and other buildings. Companies have also sought to retrofit diesel generators with KAALINK to make them carbon neutral. Graviky later buys back the captured particulate matter from the owners of these engines to incentivize pollution capture. Posted all over Graviky Lab’s Facebook page today are photos of art made from the Air-Ink and paint, including portraits, street murals, body art, sketches, and clothing prints. In London, an Air-Ink mural was featured for several weeks in Piccadilly Circus, and the city’s Museum of Writing has a permanent exhibit on Air-Ink. One Boston artist using Air-Ink is Sneha Shrestha, a native of Nepal who paints mantras in her native language, meshing Sanskrit and graffiti styles. She has been using Air-Ink for “handstyles” (a unique graffiti artist signature) and has received requests from galleries worldwide to create art using this ink. A successfully funded Kickstarter campaign over the summer sold out on various Air-Ink markers and decorated T-shirts, postcards, motorcycle helmets, and shoes. According to Graviky, each ounce of Air-Ink — about enough to make one marker — offsets 45 minutes of air pollution generated by a vehicle. But the aim wasn’t always to create art. “I started with the general question, ‘What are the things you can do with carbon that’s collected?’” Sharma says of his early days designing the technology in the Media Lab’s Fluid Interfaces Group with Pattie Maes, a professor of media technology and academic head of the Program in Media Arts and Sciences. The initial prototype for the device, developed in 2012, was actually a printer that sucked in carbon and filled an ink cartridge, and would be used strictly for paper printing. But the printer wasn’t scalable, so Sharma refined the bulky device into an exhaust retrofit that could go “beyond the lab and have real-world impact,” he says. At first, there was still no specific application for the ink. Then, about a year ago, the startup decided to find new ways to further spread its mission. It chose to do so through art. “Art helps us raise awareness about where the ink and paint comes from. Artists are spreading the word that this is a very special ink that makes a difference,” Sharma says. 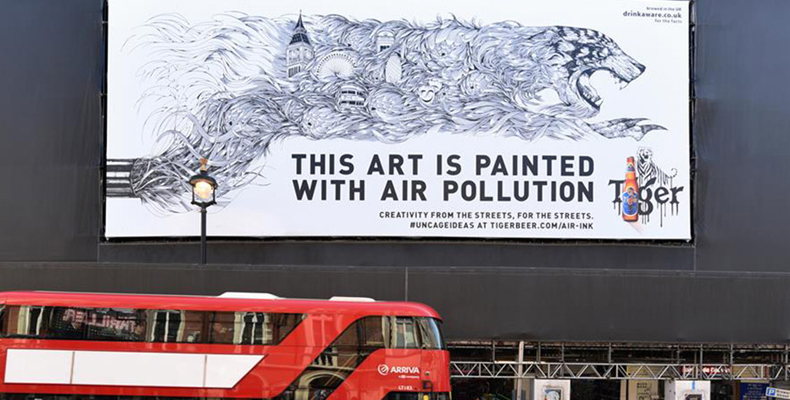 In March, Tiger Beer reached out to Graviky to create a large campaign against air pollution. For the project, Graviky gave 150 liters of Air-Ink — or, roughly 2,500 hours of air pollution, according to Graviky — to artists in Hong Kong, known for its high air pollution, to create murals. This effort won the startup several awards, including a Gold at Cannes Lions for outdoor impact innovation. Fabulous! The world needs artists who live in the real world challenging real problems more than ever. real world, real problems. Indeed! Interesting project you’ve got there…I’m not familiar with science, but the way Graviky Labs spread the message is really brilliant. Scientists have cleared the path, artist should have come up with something. It’s a perfect timing!